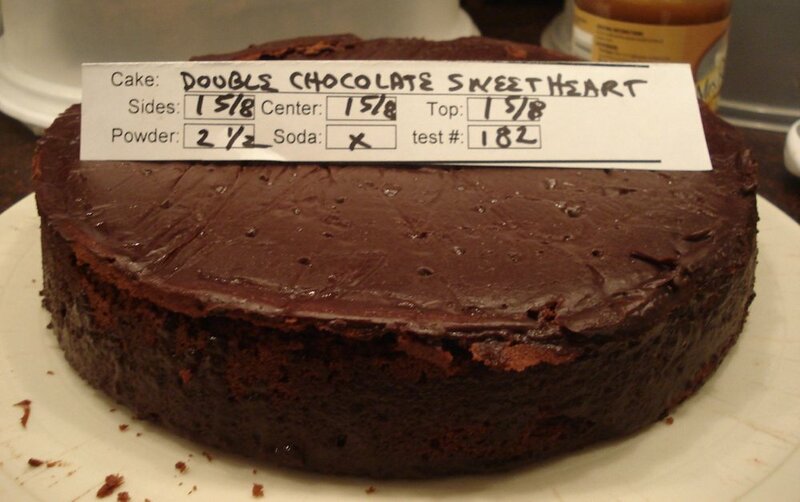 When I served as a chocolate cake consultant for Procter and Gamble, I was asked the intriguing question: How would I make a cake taste the most chocolaty possible if I had no limitations. This question, delightful to contemplate, was particularly interesting because cocoa makes the most chocolaty tasting layer cake but chocolate, melted and mixed with cream, offers the fullest chocolate hit. So my answer was that I would make a cocoa layer cake, using the best cocoa, with all yolks (which gives the fullest flavor) and after baking, inject it with my favorite eating chocolate melted with cream (ganache). I would store it in a room filled with chocolate because chocolate absorbs all aromas to which it is exposed and to enhance the experience further, I would have people eat it in a room filled with chocolate, because what you smell while you're eating has a powerful effect on what you taste. The cake based on my chocolate fantasy turned out to be so delicious and chocolaty it needed no further help of storage or eating environment. It is astonishingly easy to make and is at once fudgy-moist and soft within, encased by a thin glaze of chocolate that forms by itself after brushing in the ganache. This recipe is also in Rose’s Heavenly Cakes and Rose’s Celebrations. 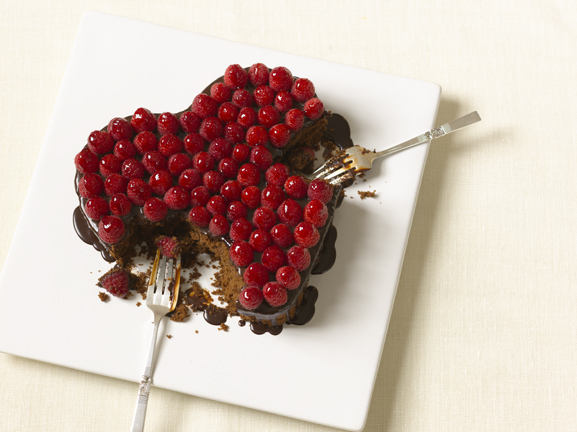 For Valentine's Day I like to bake the cake in a heart-shaped pan and top it with fresh red raspberries, brightened with a gilding of current jelly. Special Equipment: A 9 by 2-inch heart-shaped or round cake pan (8 to 8-2/3 cup capacity), bottom coated with shortening, topped with a parchment heart or round, then coated with baking spray with flour. Encircle the pan with a cake strip (see Baking Pearls). * 20 minutes or longer before baking, set an oven rack in the lower third of the oven. * Set the oven to 350°F./175˚C. * In a medium bowl whisk together the cocoa and boiling water until smooth. * Cover with plastic wrap to prevent evaporation and cool to room temperature (about 30 minutes). To speed cooling, place it in the refrigerator. Bring it to room temperature before proceeding. * In another bowl lightly combine the yolks, the 3 tablespoons water, and vanilla. 1) In the bowl of a stand mixer, fitted with the flat beater, mix the flour, sugar, baking powder, and salt, on low speed for 30 seconds. 2) Add the butter and remaining cocoa mixture. Mix on low speed until the dry ingredients are moistened. 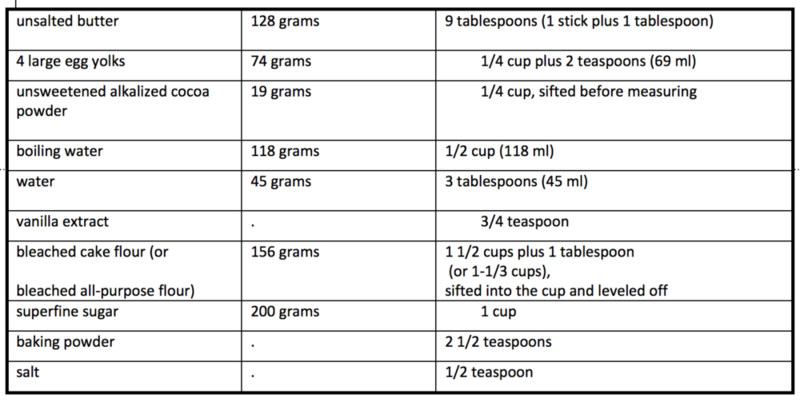 Raise the speed to medium and beat for 1 1/2 minutes to aerate and develop the cake's structure. Scrape down the sides. 3) Starting on medium-low speed, gradually add the egg mixture in two batches, beating on medium speed for 30 seconds after each addition to incorporate the ingredients and strengthen the structure. Scrape down the sides. 4) Scrape the batter into the prepared pan and smooth the surface with a spatula. 5) Bake 30 to 40 minutes or until a tester inserted near the center comes out clean and the cake springs back when pressed lightly in the center. The cake should start to shrink from the sides of the pan only after removal from the oven. 6) While the cake is baking, prepare the glaze. 7) Break the chocolate into pieces and process in a food processor until very fine. 8) Scald the cream (heat to the boiling point. Small bubbles will appear around the edges). 9) With the motor running, pour it through the feed tube in a steady stream. Process a few seconds until smooth. (Alternatively, grate the chocolate, place it in a small bowl and stir in the scalded cream until the mixture is uniform in color. Transfer the chocolate glaze to a small bowl and keep it warm. 10) As soon as the cake comes out of the oven, place the pan on a rack, poke holes all over the top of the cake with a wooden skewer. 11) Use a brush to dabble half of the chocolate glaze onto the cake. It will take about 10 minutes. 12) Run a small metal spatula around the sides of the pan and the cake, pressing firmly against the pan. Invert the cake onto a flat surface, such as a card board round or plate, which has been covered with plastic wrap or waxed paper. Peel off and discard the parchment and poke holes all over. 13) Dabble with the remaining glaze, brushing a little onto the sides of the cake as well. Cool completely, for 1 or more hours, until the chocolate is firm to the touch. 14) Invert the cake onto a 10-inch cardboard round or 10 inch perfectly flat plate, covered with plastic wrap. Peel off the plastic wrap, then reinvert onto a serving plate. 15) Place the raspberries closely together to cover the surface of the cake, starting at the outside border and working in towards the center. 16) In a microwave oven or small heavy saucepan over low heat, melt the current jelly. Use a small brush to paint the current glaze onto the raspberries. Store Airtight, without raspberries: room temperature, 3 days; refrigerated, 1 week; frozen, 3 months. with raspberries: room temperature, 1 day; refrigerated, 3 days. Do not freeze. * If making the cake without the raspberry topping, use a pastry brush to stipple the chocolate glaze after is almost set for a more attractive appearance. You may also dust it lightly with cocoa or powdered sugar by placing it in a strainer held over the cake and tapping the edge of the strainer with a spoon. * If making the cake in a heart shaped pan, we have a posting on our Weekly Baking Tips page: Make Your Own Cake Strips for making the cake strip with aluminum foil and paper towels. * You may want to check Marie Wolf's “Heavenly Cake Bake Along” and read fellow bloggers' comments on their baking through most of the recipes in Rose’s Heavenly Cakes. Lots of step-by-step photos, variations at times, and great stories as well. The portal to her blog site is on our Rose’s Heavenly Cakes page. 1. Click on Rose’s Books, then scroll down to Rose’s Heavenly Cakes book cover and description. 2. Click on Discover More Rose’s Heavenly Cakes Page. 4. Click on the book’s endpapers image to link you to Marie’s blog. 5. You can then do a SEARCH on her blog for the Chocolate Chocolate Valentine to see how the Heavenly Bakers made theirs. 2) Beat the mixture on medium speed just until stiff peaks form when the beater is raised. 3) Use a number 5 large star tube and pastry bag to pipe a shell border around the base of the cake.